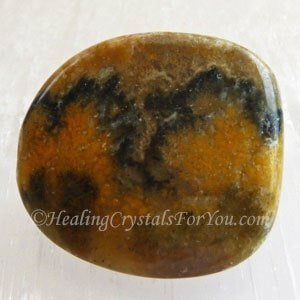 Bumble Bee Jasper is a strong earth energy stone, that embodies within it the strong energy of the volcano from which it was birthed. It is an unusual stone that was formed where a volcano opened to the earth. 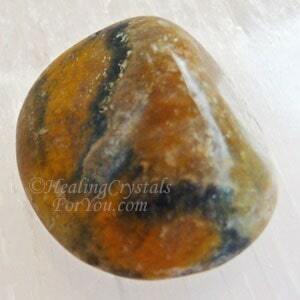 These stones stimulate both the sacral and solar plexus chakras. 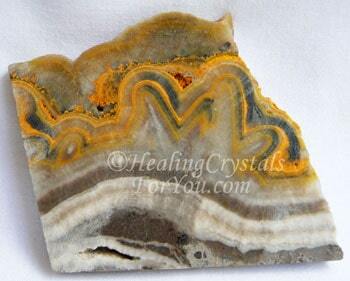 It is also known as Eclipse stone and as Fumarolic or Fumarole Jasper. The meaning of its name relates to the fact that the colors and swirls resemble the colors on bumble bees. 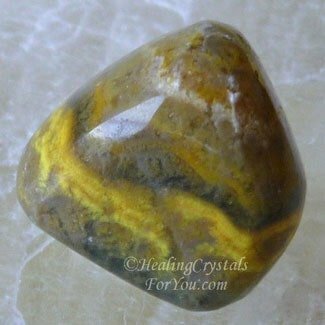 It is common for there to be quite beautiful swirling colors in these stones, in a mixture of bright yellow, brown and white. This stone is said to be a mixture of a number of minerals, including sulphur, hematite, ilmenite, anhydrite, as well as ash from the volcano. Do take care if you choose to use this stone as it contains arsenic and sulphur both of which are toxic. They are quite beautiful, but make sure you only use a sealed stone. Many stones contain cracks or fractures, and while these are natural, be aware that they may make it necessary to use this stone with care. These stones come from the island of West Java in Indonesia, and are not really members of the Jasper family as they do not contain quartz. 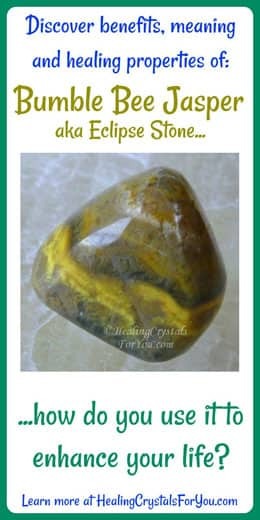 These metaphysical properties of Eclipse stones are known to assist you by enhancing your creativity and may be advantageous if used in combination with other stones that boost creativity. 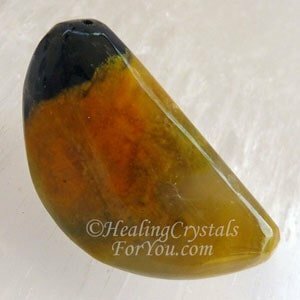 These stones resonate within the solar plexus chakra and may help to ease stress and worry related to others opinions of you. 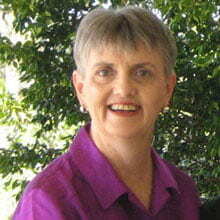 They are also said to help to stimulate mental clarity. They have a number of excellent healing attributes, including helping those who have allergies, as well as aiding healing of the organs governed by the sacral or navel chakra. I bought the above piece of stone from an online seller, and really its not a good way to use it as it is not sealed. But this gives you an idea of what the natural stone looks like.